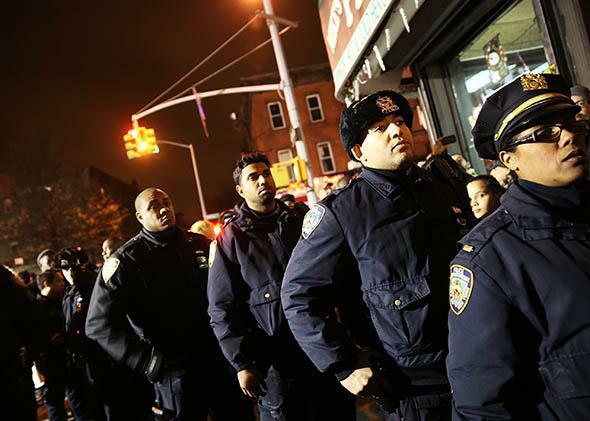 NYPD and Bill de Blasio: Why New York’s mayor was wrong to count on police support. He thought a more diverse NYPD would support a liberal mayor. Here’s why it didn’t. Police officers line up to pay their respects at the site where two New York City police officers were killed, on Dec. 21, 2014, in New York City. Increased diversity in the police ranks doesn’t mean more support from the forces for a liberal mayor. The New York Times reported this week that New York Mayor Bill de Blasio was caught off guard by just how deep the animosity toward him had grown among the city’s police officers. Though he’d run on a platform of reforming the NYPD and putting an end to its stop-and-frisk policy, de Blasio had apparently arrived in office confident he would avoid any lasting discord with the rank and file. It wasn’t until police protests in the wake of the killing of two NYPD officers last month that the mayor realized he had meaningfully lost the support of the cops. De Blasio had enjoyed overwhelming minority support in the mayoral election, winning 96 percent of the black vote and 87 percent of the Latino vote after a campaign that saw him make numerous visits to black churches, forge alliances with minority leaders, prominently feature his multiracial family in ads, and speak out against the effect of stop-and-frisk on the city’s young black men. The mayor and his aides seem to have assumed that a police department of unprecedented diversity would be friendlier to a proudly liberal mayor than it might have been in a previous era. The logic makes sense: Why wouldn’t a mayor who is overwhelmingly popular with minorities also be popular with minority cops? And the demographic shifts that de Blasio and his aides were hanging their hopes on are real. According to the Bureau of Justice Statistics, the percentage of sworn officers in the NYPD who were members of a racial minority jumped from 25.5 percent in 1990 to 34.7 percent in 2000. The trend continued in subsequent years: A study by Salomon Alcocer Guajardo, a professor at John Jay College of Criminal Justice, reported that the percentage of NYPD officers who were either black, Latino, Asian, or Native American had climbed to 47.9 percent by 2012. According to the NYPD’s own statistics, there have been more minorities than whites among patrolling officers since at least 2010. The result of these trends—which are consistent with changes at other big-city police departments around the country, including Los Angeles’ and Chicago’s—is that the racial makeup of New York’s police force is getting close to that of the city’s overall population. This is progress that promises, at least in theory, to improve relations between police and minority communities. But does it also have the potential to make police departments more open to criticism from liberal politicians? The de Blasio administration seems to have thought the answer was yes. But law enforcement experts say this is a naive way to think about police culture. The idea that race and ethnicity were going to overpower the loyalty that officers feel toward their department and thus translate into good will for the mayor, they argue, was nothing more than wishful thinking. 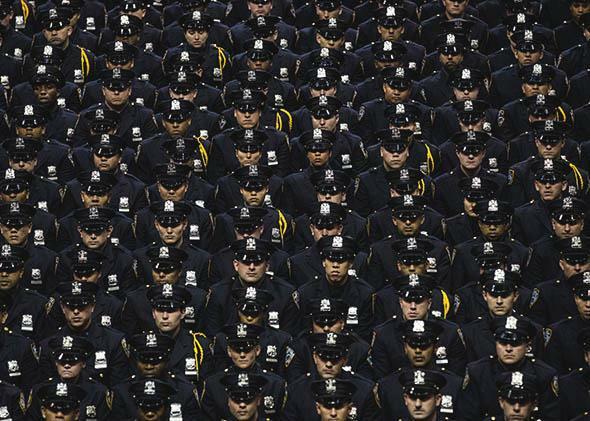 A new generation: New York City Police Academy cadets attend their graduation ceremony at the Barclays Center on July 2, 2013, in Brooklyn. When police forces diversify they become less monolithic places intellectually and culturally. The range of acceptable opinions within the department expands, as does the range of models for what it means to be a good police officer. Minority officers often form their own organizations, which can give voice to views different than the ones taken by the department or by the police union. Those organizations also can serve as a bridge to organizations outside the department interested in issues facing minority communities. There are also important one-on-one interactions: minority officers tend to broaden the perspective of the white officers they work with, particularly their partners. This might explain why the police protests against de Blasio have not been entirely monolithic——why only some officers elected to turn their backs to him at the funerals last month, while others stayed facing forward. Still, it seems clear that de Blasio miscalculated the extent to which the Police Department’s growing diversity would affect the stance that officers, and the unions that represent them, would take toward him. He also might have underestimated the power of police culture to shape the perspective of those who are immersed in it, no matter who they are or where they’re from. “It was a bit of a rookie move on the part of the mayor to assume that the increased diversity is going to lead to quick changes in the outlook and mentality of police officers, and the way they go about their work,” said Akwasi Owusu-Bempah, an assistant professor of criminal justice at Indiana University–Bloomington, who has studied the views and experiences of minority police officers. Owusu-Bempah said he has interviewed black officers who had “very liberal” political views when they first entered the force that quickly gave way to clannishness. As part of the acculturation process—and the toll of regularly witnessing the results of people committing crimes—these officers came to feel suspicion toward the general public, and to see themselves and their fellow officers as being separate from the rest of society. The power of the cultural allegiance that emerges from such feelings is significant, Owusu-Bempah said, no matter how much department demographics evolve. “Even though the face of the officers has changed, they’re still operating within this world that is deeply conservative.” And insofar as demographic changes do matter, their impact will take a long time to reveal itself.